Despite the direct contribution of community-engaged research towards effective translation, establishing strong and sustained community academic research partnerships remains a challenge. The Georgia CTSA Community Engagement program developed and implemented three models for using small grants to seed new community academic partnerships for research. The first was community-initiated health projects with faculty partners. Second, was dissemination of discoveries to community partners and third was building collaborative research capacity. 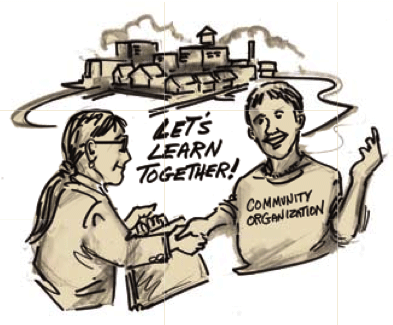 Community-based participatory research (CBPR) hinges upon community-academic partnerships and sharing of leadership in the planning, implementation, evaluation, and dissemination of initiatives. Engaging in such research requires the investment of both time and resources into the relationship with the community-based organizations (CBOs) and/or others who are gatekeepers to the sustainability of the community’s part in the project. Georgia CTSA investigators and leaders Michelle Kegler, DrPH, MPH, professor, Department of Behavioral Sciences and Health Education, Rollins School of Public Health, Emory University, and co-director, Community Engagement program, Georgia CTSA and Ernest Hopkins, executive director, The Phoenix Group Foundation, Inc. and member of the Georgia CTSA Community Steering Board with others recently published lessons learned from the three models in The Journal of Health Care for the Poor and the Underserved. In the paper, the team describes each model in terms of its purpose, funding level, funding period, proposal requirements, selection criteria, and faculty involvement. Resulting partnerships are described, along with benefits and challenges from faculty and community perspectives, and lessons learned in using these mechanisms to promote community-engaged research. “These models may aid others attempting to promote community-engaged research for the purpose of narrowing the gap between research, practice and ultimately, impact on community health,” said Kegler. Georgia CTSA’s Community Engagement program is a core component of a collaborative effort between Emory University, Morehouse School of Medicine (MSM), Georgia Institute of Technology (Georgia Tech), and University of Georgia (UGA). The program improves the way biomedical research is conducted and disseminated throughout Georgia and across the country. It works to unite existing academic-community research partnerships, facilitate community input into university research, and to increase health research in community settings that is both responsive and relevant to the health needs of the community. The Georgia CTSA is a statewide partnership between Emory, Morehouse School of Medicine, Georgia Tech, and UGA and is one of over 50 in a national consortium striving to improve the way biomedical research is conducted across the country. The consortium, funded through the National Center for Advancing Translational Sciences (NCATS) and the National Institutes of Health’s Clinical and Translational Science Awards, shares a common vision to translate laboratory discoveries into treatments for patients, engage communities in clinical research efforts, and train the next generation of clinical investigators.